USDA S/D reports are behind us for the time being, which means weather model watching to try to get idea of how the planting is going to progress this year. 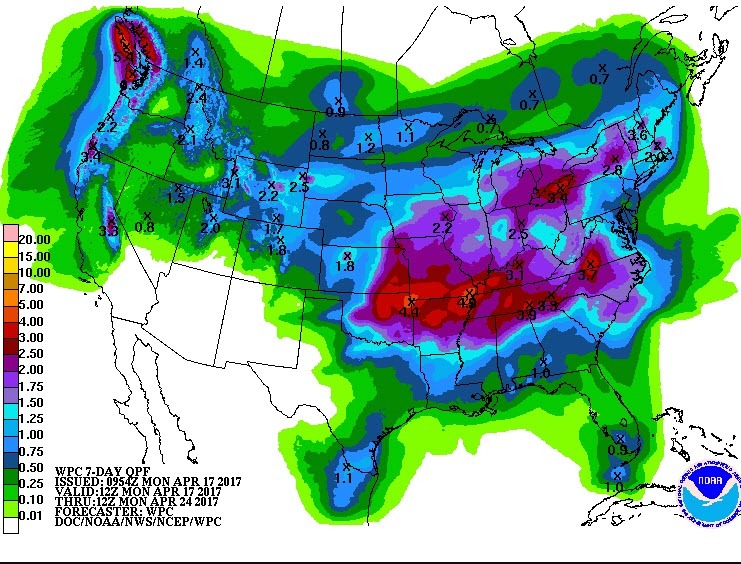 Over the weekend, ag twitter was a buzz about how wet the forecasts were showing the majority of the corn belt in the coming weeks. Last night, I think many were expecting corn to explode higher but were disappointed when markets fizzled after a slight uptick last night on the open. The CFTC numbers (check out the web link below) showed CBOT markets as combined short as at any point since Q1 2016. All of this points toward some short covering event in the future, but for now the catalyst appears to be lacking. The perceived planting delays could be something to worry about, but its still somewhat early to get too concerned and move the shorts out. My short term outlook is on the May delivery and expiration of basis contracts at the end of April. There is still a lot of corn and wheat left to price from last year, there is a time wall some producers face over the next two weeks as they either price or roll. The last few delivery periods have seen bullish price action two weeks out, only to fall apart as the close of the month approaches. Weather is on the mind of everyone I speak to. For those looking to get a jump on forecasts, check out the NOAA 6-10 day forecasts and the NOAA 8-14 day forecasts found HERE. The forecasts have shown above average chances of rain for almost the entire growing region. The Central US weather shows a lot of rain chances through May 1 as systems are forecast to come through the I-35 corridor through Missouri and Iowa every 2-3 days. . This has produced some of the selling in corn on the hope that seed can make it in the ground. Both Euro and NAM models are cooler with near to below normal temps into the closing days of April. Not great for planting, which I think has the capability to give the market a boost. I would not lift price exposure at this point. I think May could see 380 before it expires basis contracts and July could be poised to push 390 in the coming week. Producers face decisions in my opinion at those levels for corn. Chinese GDP data was released last night to the highest levels seen since Q12016. The trend is important here. As you can see below, growth in China had seen Q/Q falling growth rates since late 2014. It appears those trends are reversing. Commodities can not perform over the long term without a Chinese growth story. Speaking of China, it was announced farmers there would be increasing bean acres 8% year over year and dropping corn acres 4%. Corn faces a Chinese glut right now, the growth in China and the lower of acres is something that longer term is very supportive. Cotton markets awoke to a bullish move that many in the CBOT markets envy. The West Texas regions missed rains that were expected, that could be the reason as could be the chart above. Export sales have been fantastic for the last few months with sales running 5% of pace. We have almost committed 100% of what we did a year ago. Fresh news is tough to find in cotton markets at this point. Seasonally, we begin a month long sell period for July cotton at the beginning of next week. Folks hedging off July would be encouraged to reestablish puts, if you took them off last week. CFTC data from last Tuesday is actually pretty current given the market close on Friday. Keep in mind the data comes out as of the close on Tuesday. 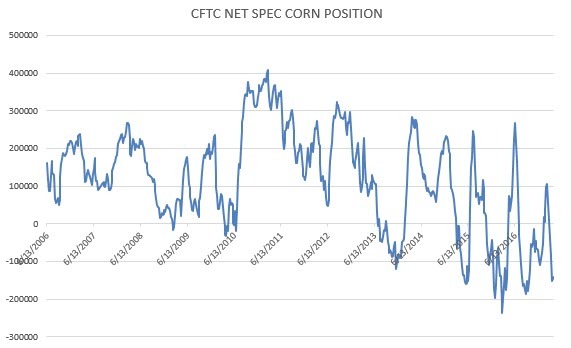 Starting with corn, spec shorts remain heavily short right now as US and S.AM supplies pile up. 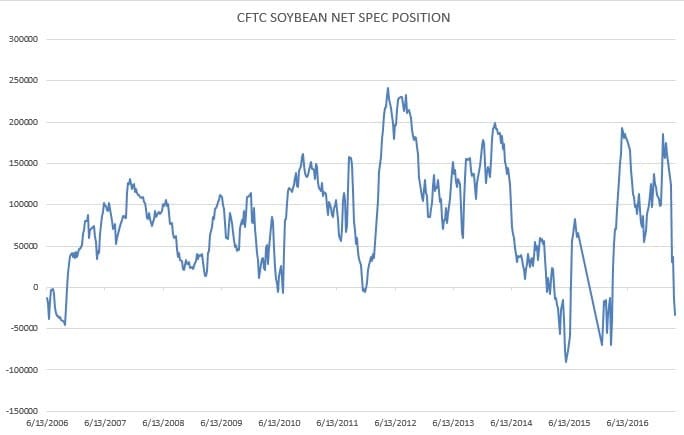 Soybeans net spec position sits at a net short level for the first time since Q12016 and for only the 4th time (continuation) over the last decade. 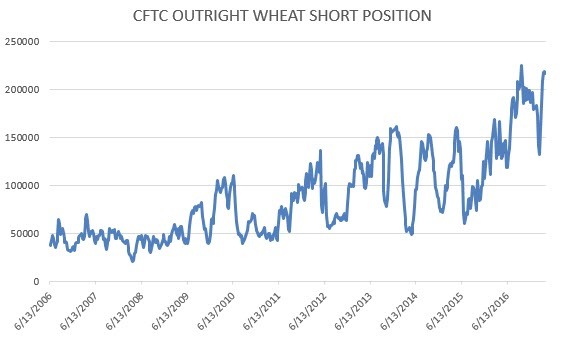 The outright short position in wheat is climbing back to levels seen earlier this year while cotton positions have adjusted to levels back at what was the previous high in 2012 and 2016. 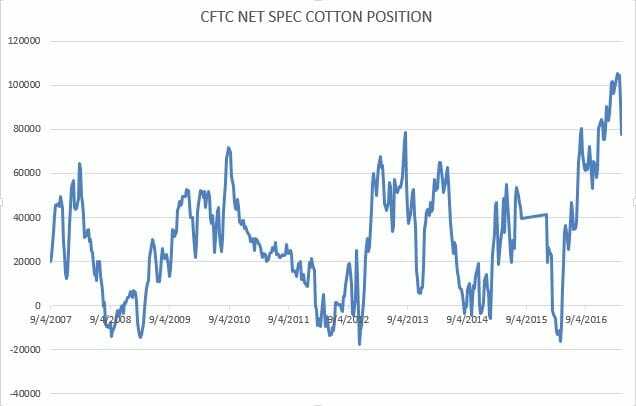 The bottom line here is that in CBOT markets, the spec bets are short and getting shorter while in cotton the turn appears to have been made. Maybe the funds are just stepping aside temporarily, if not they still have a long way to fall. Long term I remain bullish corn, wheat and neutral soybeans while I would be bearish cotton over the shorter run. The schedule this week from the USDA will have a cattle focus, be ready if you are in those markets.